Last week, Irish Genealogy News reported that the Troy Irish Genealogy Society (TIGS) released another fantastic database of records. 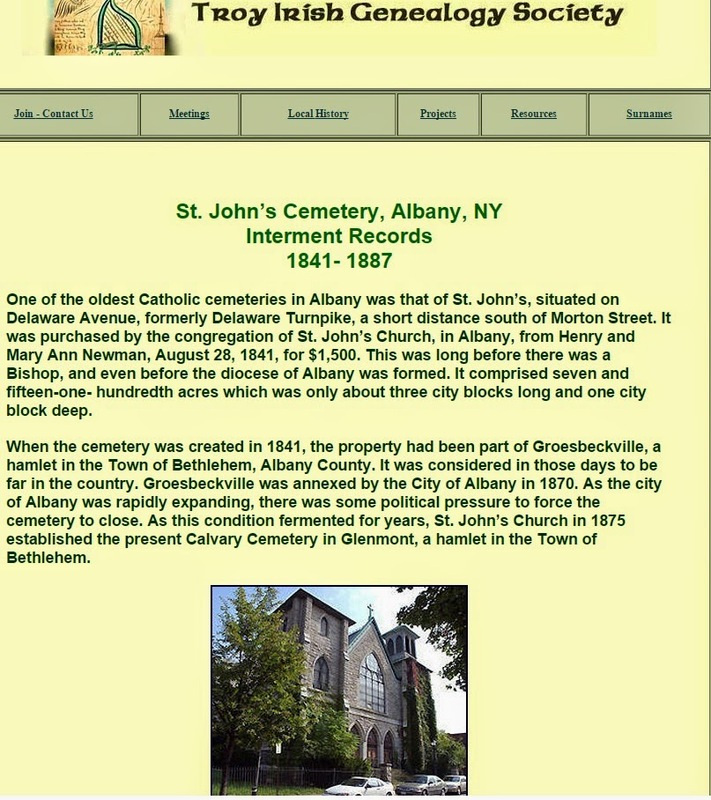 St. John’s Cemetery, Albany, NY Interment Records, 1841- 1887 contains over 12,700 transcriptions, of which almost 4,000 of these are for people from Ireland. What makes this record set even better is that the county of origin is provided for almost 3,400 of those Irish-born people. The importance of having local knowledge and of preservation efforts are both seen in the description of how these records came to light. The TIGS website outlines that the interment book was in the possession of a former employee of another Catholic cemetery in the area and was in a gradual state of decay. Who know what would have happened to these records if they had not been discovered by those who knew the genealogical importance of the information contained in that book. You can read all about the records and access the database in the TIGS website by clicking here. Troy Irish Genealogy Society is listed in the GSI database on this website. Click here to read a Townland of Origin article from January 2014 about other databases that the group launched on their website. On Thursday, I will be interviewed by Irish genealogist Lorna Maloney on The Genealogy Radio Show. The show is broadcast live and my interview will take place at 4pm Irish time/11am Eastern. The show has only been broadcast for a few months and has already had a stellar line-up of Irish genealogy experts, such as Brian Donovan, Fiona Fitzsimons, and Dr. Paul MacCotter. Thursday, of course, is Thanksgiving in the United States, So if you are looking for an excuse to get out of the kitchen for half an hour, why not tune in! You can listen, via the "Listen Live" button, on the right hand side of station's webpage. The Genealogy Radio Show is broadcast every Thursday on the county Clare based community radio station, Radió Corca Baiscinn. Podcasts of previous episodes are available to listen to. 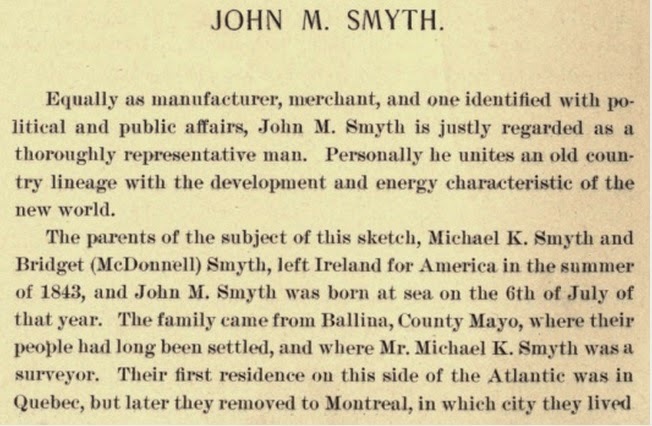 Biographical History of the American Irish in Chicago is an 1897 publication that falls into the category of books that highlight the origins, life, and achievements of notable Irish-born immigrants and first generation Irish Americans in the United States. 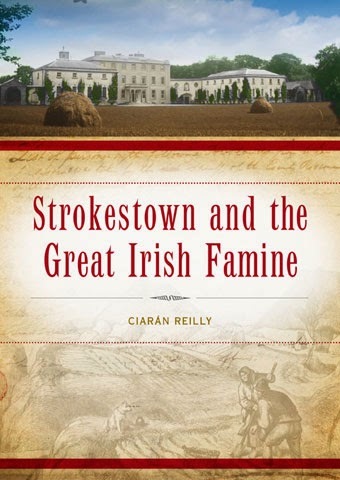 In total, the book contains information for about 300 such people who lived in the Chicago area in the 19th century. For almost every entry, the place of origin in Ireland is given for those who were immigrants. The place of origin of their parents is noted for many of those who were first generation Irish American. Other useful genealogical information is included for many entries such as year of immigration, early movements in the US for immigrants, employment history, who they married, how many children they had, and date and place of death and burial. Pictures and signatures are also included for some of those written about. As with almost all of these 19th century biographical publications, there are no citations from primary sources. Use the information as a guide in your research and, as much as is possible, verify any information with primary documents. You can read the book in full on the always excellent Hathi Trust website. Ffrench, Charles. Biographical History of the American Irish in Chicago. 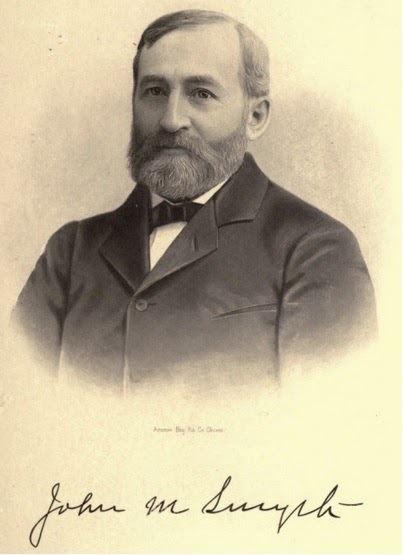 Chicago, IL: American Biographical Publishing Co. 1897. The National Genealogical Society (NGS) 2015 conference will be held in St. Louis, Missouri on 13-16 May. NGS was founded in 1903 and aims to serve and grow the genealogical community by providing education and training, fostering increased quality and standards, and promoting access to and preservation of genealogical records. 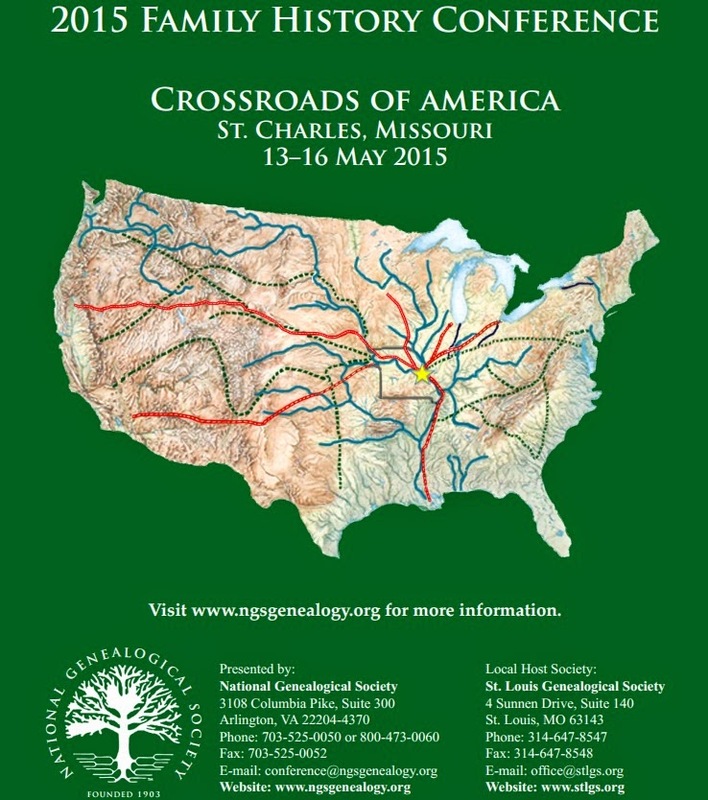 The yearly NGS conference is probably the one to attend for industry professionals and keen genealogy enthusiasts. National Genealogical Society. About NGS. Year Unknown. 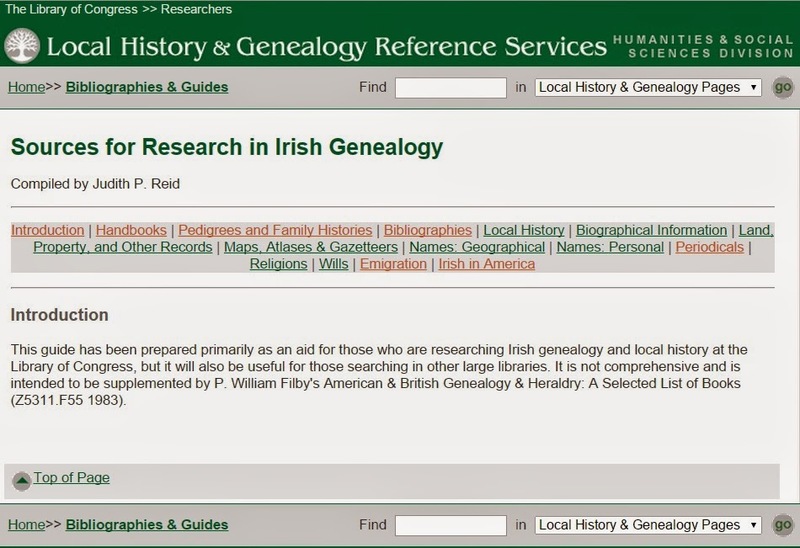 http://www.ngsgenealogy.org/cs/about_ngs: accessed 13 November 2014. Florida based genealogist Donna Moughty has organized research trips to Ireland for the last number of years. On the trips, she leads and mentors groups of people who want to do research in the main repositories on the island. These trips usually occur in October and she provides an excellent blog commentary about her research exploits. Her posts showcase the fast paced nature of these trips, mixed with the will it takes to fit in as much research as possible in two weeks; one week is in Belfast and the other in Dublin. The 2014 trip visited all the major repositories: Public Records Office of Northern Ireland, Northern Ireland Registry of Deeds, National Library of Ireland, National Archives of Ireland, Valuation Office, Registry of Deeds, and the Back To Our Past genealogy conference. She has just recently returned and you can read all the posts, starting here. You can also read about the 2013 and 2012 trips. Are you thinking of taking a research trip to Ireland? You could do worse than inquire about here 2015 trip! Over the last number of months the Archdiocese of New York has deliberated about which of its parishes will be closed or merged. Their decisions were made public on 2 November. Two different lists were published. One list shows parishes that will merge, with one parish church being the designate. Masses and sacraments will still be celebrated in the second church. The second list also shows parishes that will merge, but where one parish will be the designate and the church in the other parish will only be used for some special occasions. Masses and sacraments will no longer be celebrated in the second parish. So what does all this mean for genealogists who want to apply for copies of the information that was recorded in the registers when the sacraments were performed (e.g. baptisms and marriages)? From what I can gather, there has been no guidelines put forward for this set of mergers but we do have precedent to work with. The Archdiocese previously carried out a round of parish mergers and closures in 2007. In most cases, the registers from parishes that were merged and no longer used were given to the neighboring parish that they merged with. 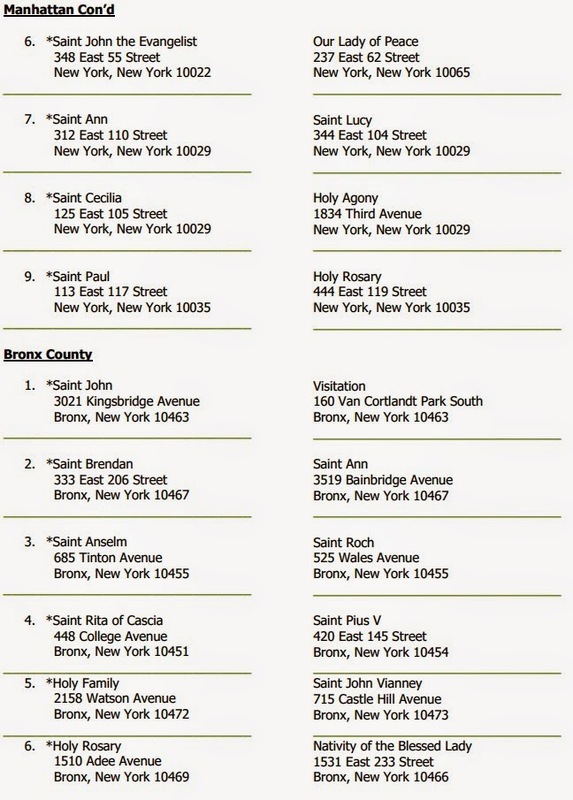 You can access a useful graphic showing the Archdiocese and the affected parishes in this New York Times article. You can read the full official press release, by clicking here. 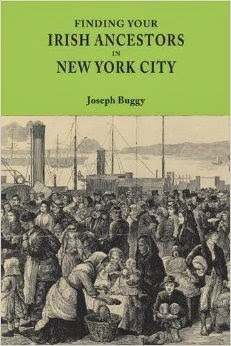 To learn more about every Catholic parish that has ever existed in all five boroughs of New York City, you can consult Chapters 7 & 8 in my book, Finding Your Irish Ancestors in New York City. Manhattan, the Bronx and Staten Island are in the Archdiocese of New York. 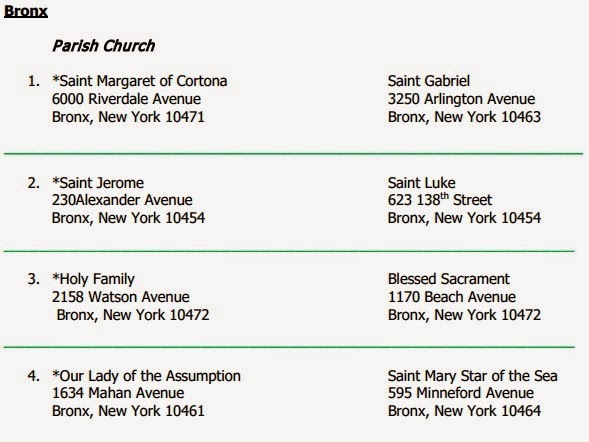 Queens and Brooklyn are in the Diocese of Brooklyn. Archdiocese of New York. Parish List 1 - Masses and Sacraments celebrated at both churches. 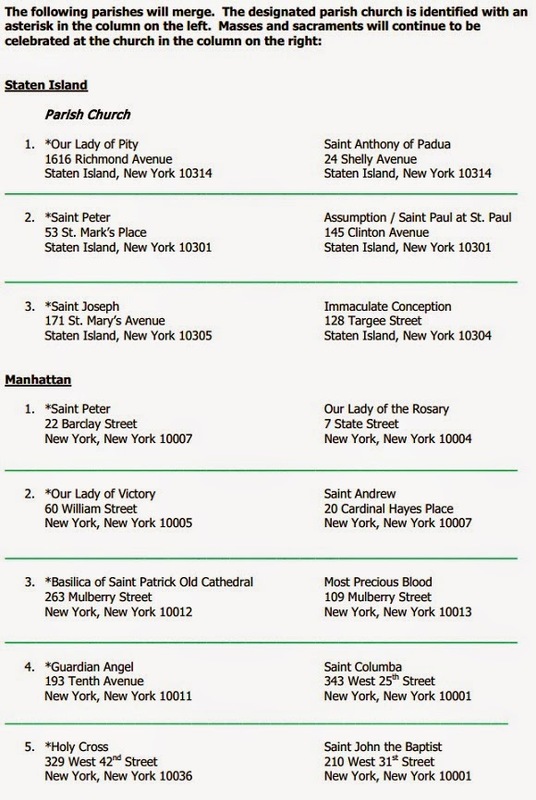 2014. http://archny.org/documents/2014/11/Parish_list_1_final_-_both_churches_103114_2.pdf: accessed 4 November 2014. Archdiocese of New York. 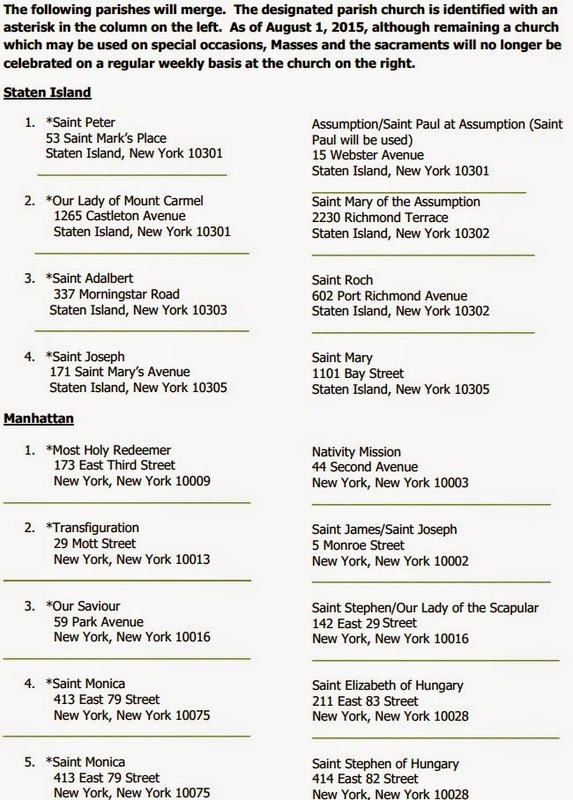 Parish List 2 - Masses and Sacraments to be celebrated at the designated parish church; the other church may be used on special occasions http://archny.org/documents/2014/11/Parish_list_2_final_-_one_church_103114_2.pdf: accessed 4 November 2014.